Winn FREE cloth diapers from Diaper Junction! Diaper covers and prefold cloth diapers are among the easiest and most economical method of cloth diapering. Although referred to as "traditional" or "grandma's" cloth diapers, to this day modern cloth diapering families have continued to use and love this no-frills system. 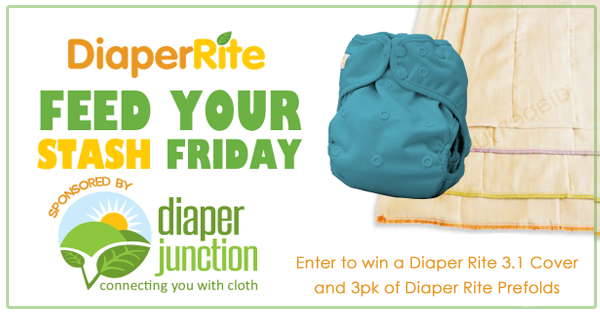 One lucky Diaper Junction fan will win their choice of ANY in stock Diaper Rite 3.1 OS Diaper Cover and a 3pk of Diaper Rite Prefolds in the size of their choice! Enter to win using the embedded rafflecopter form below. This contest is open to the USA & Canada. Winner will be notified by email and will have 7 days to reply and claim their prize. My twitter name is @ashleystone87 For some reason it submitted before I was done. Thanks for the opportunity!